Matthews, Robin F. 1993. Montia diffusa. In: Fire Effects Information System, [Online]. to: spreading minerslettuce. The distribution map was also added. subspecies, varieties, or forms [4,7,11]. Nevada crest from British Columbia to northwestern California [4,7,11]. 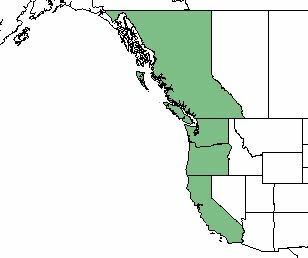 Distribution of spreading minerslettuce. Map courtesy of USDA, NRCS. 2018. The PLANTS Database. National Plant Data Team, Greensboro, NC [2018, May 30] . approximately 0.06 inch (0.15 cm) long [4,7]. Spreading minerslettuce flowers from May to July . survival following fire was not available in the literature as of 1993.
years, allowing for secondary colonization by on-site seed . 10. USDA Natural Resources Conservation Service. 2018. PLANTS Database, [Online].